An oceanic-scale demand push from “all parts Far East” is building, as the desire to own gold and silver promises to place an increasingly solid foundation for years to come. China, India, and Southeast Asia have historically accumulated precious metal as a savings vehicle, a hedge against political uncertainty (e.g. India’s surprise call-in last year of 80% of the country’s paper currency), and as an expression of affection. China’s newly-emerging affluent middle class alone is set to become larger than the population of the U.S. Frank Holmes collectively refers to these elements as “love and fear trades”. China’s One Belt-One Road (OBOR) Initiative – the world’s largest-ever construction project – is designed to link 60% of the world’s population in a cooperative financial and economic matrix. Taken together, the continued migration of gold supply from West to East is baked into the cake. For a deeper understanding of how and why China is leading the charge – and going about capturing an outsized portion of the global gold supply – see my essay from last summer, titled China’s Get the Gold Plan: Part II. Even as the West ships much of its remaining gold eastward (largely via Swiss refineries who “repurpose” it into .9999 fine gold), countries like Germany and Turkey have stepped up to the plate, becoming noteworthy demand drivers in their own right. Fund managers are finally realizing that gold deserves to be a permanent portfolio asset holding category. In The Morgan Report and in Riches in Resources, David Morgan has written extensively about this for both individual investors and institutional clients. Just one more “silent lever” by which a long-term, rock-solid foundation is being built under gold’s demand… and price. Metaphorically-speaking, available data strongly suggests (with evidence mounting sharply since 2015), that over the next few years an ongoing narrowing of the global gold supply’s veins and arteries is leading to a series of demand seizures, climaxing in a systemic “heart attack”. South Africa’s Witwatersrand Basin has been the source of almost 40% of all the gold ever recovered. But the government has become so obdurate that its current declining rank as the world’s 7th largest producer looks set to fall even more. Mining “nationalism” has re-introduced one of the most crippling elements a mining producer – or explorer can face…unpredictability. If there is no certainty that some sort of “rule of law” will prevail, then trying to anticipate/ predict how much gold and copper will/can be produced in a given operation flies out the window. Look how much is going on right now as gold hovers “merely” around $1,300 per ounce. What do you think that this witches’ brew of greed, corruption, power-grabbing and incompetency is going to produce when gold trades – as it will before long- at $2,000, $3,000, $5,000 or more? Even without heavy-handed regulations, South African mining would be facing increasing costs as mines go deeper to access gold and platinum. The way things are going, the last nails in the coffin appear set to be hammered into place. In the early 1970s, annual gold production topped out at an amazing 1,000 tons. 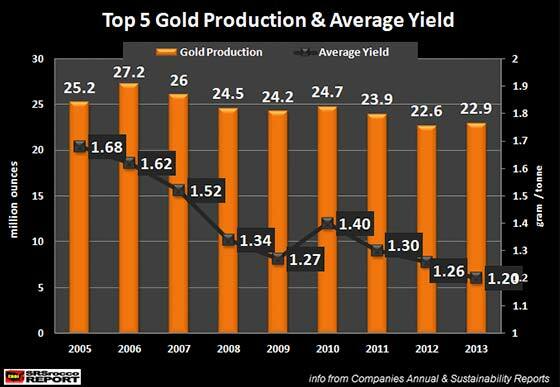 Since 2000, gold production has literally fallen off a cliff, as it spirals downward toward a paltry 200 tons/year. They have not put anywhere near enough money into research and development, particularly for new technologies with respect to exploration and processing… it takes around seven years for a new mine to ramp up and then come to production. 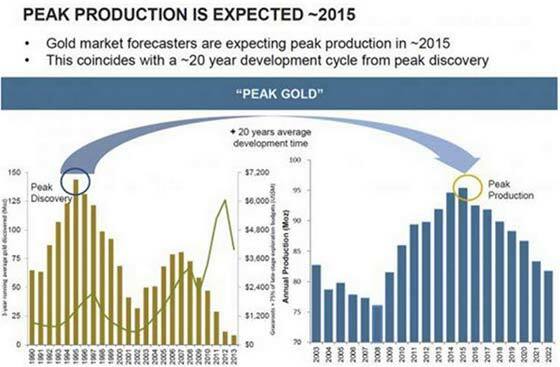 So it doesn’t really matter what the gold price will do in the next few years: Production is coming off and that means the upward pressure on the gold price could be very intense. Of the 5 formal categories estimating the amount of economically-recoverable gold a mining company has in the ground, “Reserves” ranks highest. The other 4 categories decline in estimated value and the likelihood they will ever be profitably recovered. 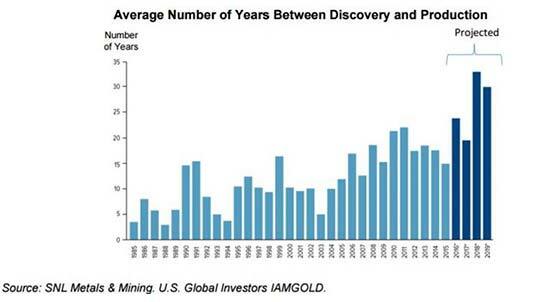 As of this year, global gold reserves barely equal those prevailing in 2004 – the very beginning of the current metal’s bull run. This, despite gold having risen from $250 to (briefly) $1,900 the ounce, and now around $1,300. Do not be lulled into complacency by this year’s muted U.S. gold and silver sales figures. 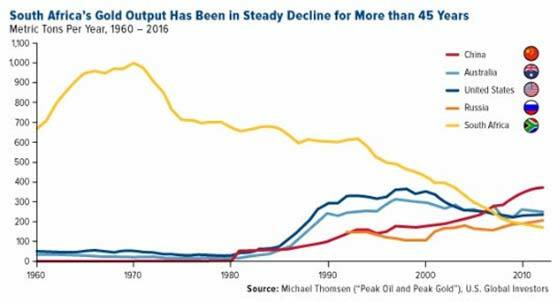 “High grading” – mining the best ore bodies first in order to remain profitable, lack of exploration success in replacing reserves in spite of increased funding, and elevated “country risk” around the globe are placing declining supply on a collision course with increasing demand. Establish and keep adding to your gold “stash” now while the price is favorable. Don’t be shut out when an unpredictable but inevitable “gold supply heart attack” takes place.